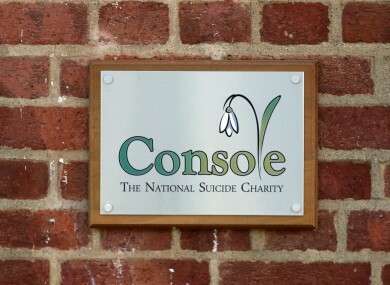 It’s feared the revelations about Console will have a negative impact on donations to charities. CONSOLE HAS NOT lost any frontline staff, despite the recent allegations of financial misconduct. Speaking to TheJournal.ie this afternoon, the interim CEO of the suicide charity, David Hall, said that a number of staff members had handed in their notice after RTÉ Prime Time Investigates unveiled the allegations, but had since withdrawn their resignation. There are currently 12 full-time staff members and 60 part-time counsellors at Console. Hall has written to the Health Minister Simon Harris to secure funds so that Console’s services for people affected by suicide can continue. He described the HSE as “the only show in town” for funding. He is due to meet with the minister and has spoken with the CEO of the regulatory authority about putting in place a new board for Console. He said the regulatory authority has appointed five directors, and now they have to be put in place. “The priority now is over to Ministers [Helen] McEntee and Minister Harris and the HSE to look at funding and a structure of funding to protect the valuable service that is being provided,” said Hall. Hall said he believed the HSE funded Console by around €850,000 a year, paid over 12 months. In an email to supporters today, Social Democrats TD Catherine Murphy said that minister of state Helen McEntee had contacted her to clarify a response given to Murphy regarding HSE funding to Console. Deputy Murphy had raised a Topical Question on the Console controversy with the Minister who responded in the Dáil saying that Console had received no funding from the HSE in 2016. The Minister has now written to say that this was in fact incorrect and Console has actually received €321,498 in HSE funding in 2016. Hall could not confirm this amount, but said that he wouldn’t have any reason to believe it is incorrect. In a statement this afternoon, the HSE said it is “considering all steps, no decisions have been made”. It added that: “Payments are made on an ongoing basis”. Earlier today, Dublin’s new Lord Mayor Brendan Carr urged members of the public to continue to make donations to charity. Speaking following the revelations about finances at suicide prevention charity Console, Carr said he is “extremely concerned at the very serious situation that many charities currently find themselves in, given the recent reputational scandals that have adversely impacted the entire sector”. Carr said there has been “a significant drop in donations and support” for many charities as a result, and called on “the goodwill of Irish people to continue to support the charity and voluntary sector”. The Labour councillor noted that thousands of registered charities rely on donations from the public to do their work in areas such as homelessness, disability and overseas aid. There is no doubt that while serious questions need to be answered about the governance structures in some charities, it is important to note that the majority of their grassroots are driven by honesty and integrity. “Like all institutions and organisations it is imperative that charities reform as required and be subjected to the same rigours of transparency and openness, and that justice be done where abuses have been uncovered. “Equally, it would be a real shame if we tar all Irish charities with the one brush, because of a self-serving minority at the top that have detached themselves from the tireless work being done by their employees and numerous volunteers,” Carr said. The allegations of financial misconduct at Console were made public in a recent Prime Time Investigates programme on RTÉ One following an audit by the HSE. The audit found that half a million euro was spent on foreign trips, designer clothes, eating out and other expenses between 2012 and 2014. Another half a million was spent on salaries and cars for Kelly and his wife Patricia. The Charities Regulator appointed five new trustees to the board of Console and David Hall as interim CEO. Multiple investigations are under way into how money was used within the charity. A number of people have defended the work being done by staff at the charity. Alone, a charity that helps older people, has released a statement acknowledging that people want to know where their money goes. All charities should be judged on their impact and effectiveness, not just on an emotive story; we must value those that have quality standards, are accountable and transparent. The charity said it has “worked for many years to ensure our services are of the highest standards” and has achieved awards for its standards. Meanwhile, a report in the Irish Independent notes that the Irish Cancer Society’s income in 2015 was €22.8 million, an annual drop of €600,000. The charity put the decrease down to some €1.2 million being generated from the no make-up selfie campaign in 2014, a one-off event. Email “Number of Console staff withdraw resignations they handed in after controversy”. Feedback on “Number of Console staff withdraw resignations they handed in after controversy”.